Yasushi Inoue has been called one of the best Japanese novelists you’ve never heard of. A prolific writer, he produced some 50 novels and nearly 200 novellas and short stories during a career that spanned four decades from the late 1940s until his death in 1991. He was sometimes mentioned as a possible Nobel Prize winner, but was never selected. Much of his oeuvre comprises meticulously recreated historical fiction, but another strand of his work deals with the social and economic realities of postwar Japan. 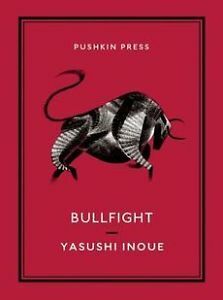 Bullfight, the story of a small-time newspaper editor’s bold, possibly foolhardy, plan to stage a bullfight in an Osaka baseball stadium, is one of those. Beautifully translated by Michael Emmerich, the 128-page novella is a disarmingly simple tale of ambition and entrepreneurial daring set against the background of a bombed-out country struggling to its feet. In 1949, when Inoue wrote Bullfight, he was already 42, yet it was only his second work of fiction. It went on to win the prestigious Akutagawa Prize. Although Inoue himself describes the book as hovering between “beginner’s enthusiasm” and “youthful ungainliness”, the story is written in tight, confident prose. Like river water flowing over pebbles, the words reveal rather than obscure meaning, which flashes beneath the transparent surface. The story takes place just a year after Japan’s surrender. The country is shattered but returning to some kind of normality. A college friend of Tsugami, the protagonist newspaper editor, has died at war but his “bones had not yet come home”. The public is still accustomed to “oafish wartime papers”, not the free-spirited publication Tsugami runs. Temple bells in Kyoto, long silenced by war, ring in the new year. Inoue’s prose contains more than meets the eye. One character is dressed in “elegant attire, from his impeccably white collar to the tips of his well-polished shoes, everything the best that could be had these days”. The words “these days” seem almost an afterthought, yet hint at daily deprivation.